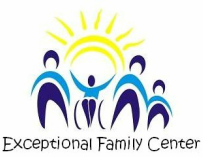 Exceptional Family Center offers parents the opportunity to gather and participate in activities and workshops. The Parent club gathers once a month to listen to professionals in our community talk about topics that are of interest to our families. During these meetings, parents have the opportunity to interact with one another, share information, and their own personal stories. The Parent Club offers a welcoming environment where parents can meet new people and create long lasting relationships. Throughout the year, EFC staff works diligently to put together events and activities that give families the opportunity to gather and enjoy themselves in a safe and welcoming environment. The events provided through our Social Club include, but are not limited to, picnics, movie nights, dances, and dinners. We welcome and encourage all families to join us for all of our fun-filled events.